The theft of data from the International Monetary Fund’s computer systems was ‘state-based’, Bloomberg sources believe. 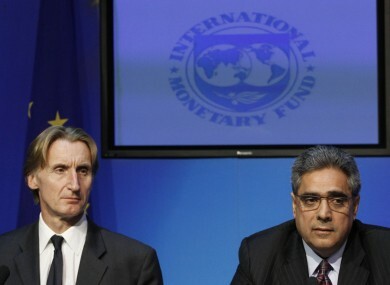 David Hawley (left) and Ajai Chopra of the IMF: the hack attack on the IMF was confirmed by Hawley over the weekend. THE HACKING ATTACK on the IMF’s computer systems late last week – which resulted in a major loss of a “large quantity” of data – is thought to have been the work of hackers acting on the authority of a foreign government. Bloomberg cites security sources ‘familiar with the incident’ who said the intrusion was ‘state based’, led by an individual country or its agents – though the source declined to suggest which country might be to blame. The New York Times, quoting other unnamed IMF officials, said the attack was “sophisticated and serious”. The Bloomberg report discusses other security breaches at the likes of Lockheed Martin and Google – where the Gmail service was compromised by hackers who gained access to the private accounts of senior US officials. Google, the report said, had traced the Gmail attack back to a Chinese high school with military links. The IMF has formally declined to discuss the attack, which was revealed to its staff via an internal email on Wednesday. Staff have been advised not to open any emails unless they can vouch for its source, given the potential for malicious trojan-style programs. Among the security measures taken by the IMF to secure its data – which includes confidential data on states to which it lends, like Ireland – was the severance of its always-on network connection to the data systems of the World Bank. Email “IMF hack attack 'the work of a foreign government'”. Feedback on “IMF hack attack 'the work of a foreign government'”.